Though more than fifteen years have passed since Ursula Hegi's Stones from the River captivated critics and readers alike, it retains its popularity, is on academic reading lists, and continues to be adopted by book groups. 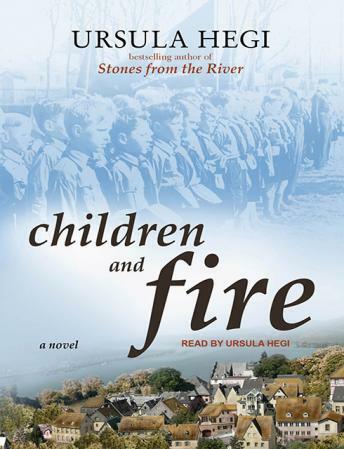 Also set in Burgdorf, Germany, Hegi's Children and Fire tells the story of a single day that will forever transform the lives of the townspeople. At the core of this remarkable novel is the question of how one teacher-gifted and joyful, passionate and inventive-can become seduced by propaganda during the early months of Hitler's regime and encourage her ten-year-old students to join the 'Hitler-Jugend' with its hikes and songs and bonfires. Membership, she believes, will be a step toward better schools, better apprenticeships. How can a woman we admire choose a direction we don't admire? So much has changed for the teacher, Thekla Jansen, and the people of Burgdorf in the year since the parliament building burned. Thekla's lover, Emil Hesping, is sure the Nazis did it to frame the communists. But Thekla believes what she hears on the radio, that the communists set the fire, and she's willing to relinquish some of her freedoms to keep her teaching position. She has always taken her moral courage for granted, but when each silent agreement chips away at that courage, she knows she must reclaim it. Hegi funnels pivotal moments in history through the experiences of individual characters: Thekla's mother, who works as a housekeeper for a Jewish family; her employers, Michel and Ilse Abramowitz; Thekla's mentally ill father; Trudi Montag and her father, Leo Montag; Fraulein Siderova, midwife to the dying; and the students who adore their young teacher. As Hegi writes along that edge where sorrow and bliss meet, she shows us how one society-educated, cultural, compassionate-can slip into a reality that's fabricated by propaganda and controlled by fear, how a surge of national unity can be manipulated into the dehumanization of a perceived enemy and the justification of torture and murder. Gorgeously rendered and emotionally taut, Children and Fire confirms Ursula Hegi's position as one of the most distinguished writers of her generation.